Amid the hustle and bustle of the Vancouver International Auto Show, one booth to the far right of the main hall was often overlooked. Attendees may not have realized that the bland space sporting a table with what looked to be two massive Duracell batteries–that turned out to be fuel cells–showed a glimpse of what the car industry may look like in the coming years. With a lineup of three futuristic-looking vehicles, the Hyundai Nexo, the Toyota Mirai and the Honda Clarity, North Vancouver-based Hydrogen Technology and Energy Corp. educated seemingly puzzled guests on the wonders of hydrogen fuel-cell technology. From the process of converting the element to energy to the availability of fuelling stations, it was a learning experience, to say the least. On the show’s opening day, HTEC and two of its partners, 7-Eleven Canada and the B.C. 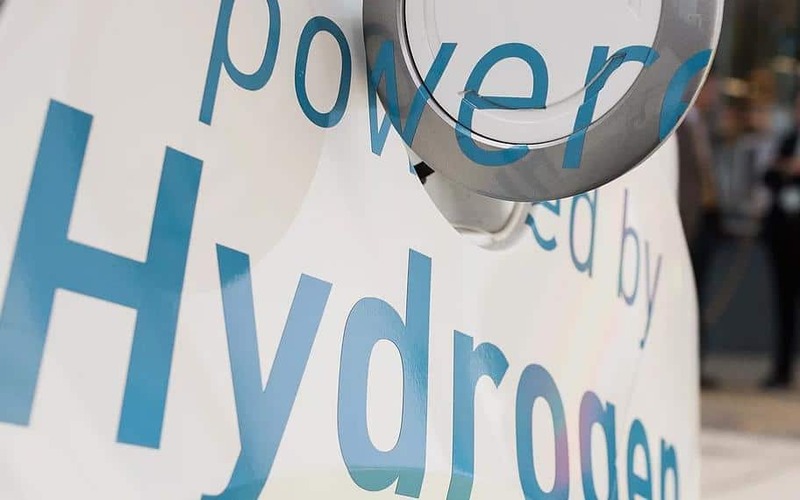 government, announced plans for two new additions to the energy company’s network of hydrogen fuelling stations and highlighted the province’s CleanBC initiative. The alliance between the two companies will bring a station to North Vancouver and a second one on Vancouver Island. The B.C. government weighed in, too. Spencer Chandra Herbert, the MLA for Vancouver–West End, announced the province’s support for the effort and emphasized its role in the nearly $1-billion clean energy program. There is one major hurdle, though. “Green” cars are substantially more expensive than their gas-powered counterparts and incapable of the same range. Also, a lack of charging and refueling station for low- or zero-emissions vehicles means you could be stranded stranded if your tank or battery hits empty. But there appears to be hope. For those suffering from sticker shock, the province has launched the Clean Energy Vehicle incentive, which will reimburse up to $6,000 of a vehicle’s cost. Meanwhile, the Scrap-It program will provide as much as $6,000 for recycling your old vehicle. As the opening week of Western Canada’s largest automobile show unfolded, the federal government announced a rebate of up to $5,000 for consumers buying new zero-emissions vehicles under $45,000. Granted, the full $17,000 in rebates only applies to select cars, most of which cost over $40,000. But at least it brings the price of electric vehicles in line with many gas-powered alternatives. More good news: the province and HTEC plan to have six hydrogen fuelling stations open by next year, and more are in the works. This should let green tech adopters sleep at night, knowing their cars won’t run dry on a weekend trip or on the way to work. The goal is ambitious but not impossible. With federal funding, support from corporations like Shell Canada and 7-Eleven Canada, and the provincial government’s backing, these measures may see hydrogen technology take over the car market soon enough as many of B.C.’s citizens become fed up with gas prices.